The eastern end of NY 437, so short you can see the other end (NY 38) from here. 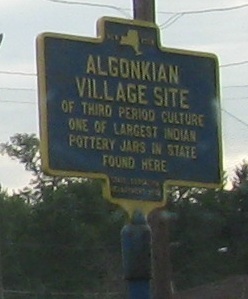 This is the only sign of interest on the route, and practically the only sign at all. 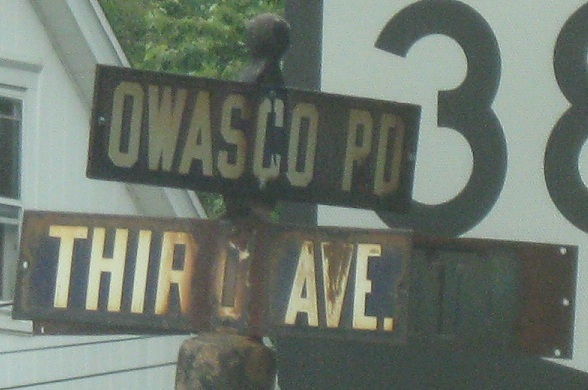 Embossed enamel street signs decorate southern Auburn. 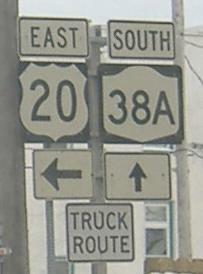 NY 38A officially starts at NY 5 on John St. and crosses Genesee St. at the left turn indicated in the second photo, where it splits from US 20 EB. For the block of Genesee St. east of there, though, there is no route on the WB side because US 20 WB has already jumped up to the Arterial with NY 5. 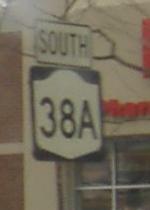 To fill the void, NY 38A is signed not as "TO," but as if this is the actual route. 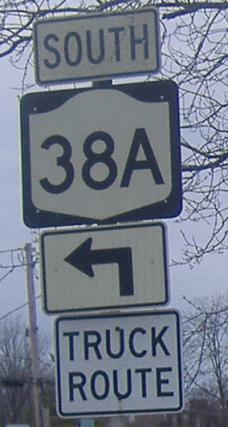 John St. SB, carrying US 20 EB and the beginning of NY 38A away from NY 5. Why not just begin NY 38A at 20?